Prologue -- isn't often that I disobey The Rules. I mostly stick to the speed limit, even along Playford Road. I mostly return library books, some on time. I mostly pay for my music, as long as it's readily available. It's wrong to break The Rules. Break 'em, and they'll bite you. Contractual obligations brought us back to The Old Lady, Mme. Woodbridge. 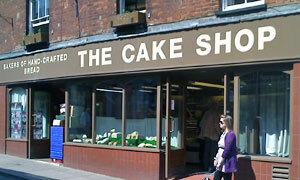 Ever in search of the new-ish, I proposed a cut-and-run trip to a high street institution, the Cake Shop. Let's grab some takeaway items, I said, and find a sit-down scoffing spot. They agreed. In we go, past The Girl With The Dog (canine out of frame), and choose from the array of baked goodies. Plenty of pasties, a plethora of pies, a raft of rolls, you get the pastry picture. For though their name implies sweetness, these are Bakers Of Hand-Crafted Bread, they'll have you know. Artisans, to use the modern term. There's Suffolk trencher, fruit brioche, beaver bread (? ), and more, oh so much more. Best to grab and go else you'll be numbed by the choice: chilli chicken roll for me and a choice yellow bag of the finest Quavers. While we're here, subject-wise, let's say a quick farewell to the dearly departed Loaves & Fishes down the road. That is all. My idea to walk a few short steps to a popular local coffee shop -- ciao, Costa -- and claim a table, furtive paper bags in tow. To legitimise lunch, let's buy an official Whitbread-endorsed drink inside and bring it outside. Super. All 50% above board. I'm sipping freshly squeezed juice when a lady at the next table comments on its colour: an innocuous conversation ensues about citric beverages. Course, she says, the best coffee is to be had in my home country. Looking back, I should have seen this as a cue to form an exit strategy. Within seconds, there's talk of occupied territories, alternative healing, small-minded Suffolk folk and Woodbridge as Zombieville. Hot in the sky, icy cold down here. Somehow we prise ourselves away from what's become an unpleasant and surreal exchange, and talk among ourselves. But when I go in to buy a coffee, she's there behind me in the queue. You're clearly not interested in me, she says. Er, that's right, I say. So don't talk to me, she says. OK, I say. And that's what can happen when you bring your own food to the table. If it was a car -- stretch limo. If they were passing by -- David Icke.